Who makes big, bigger than 55T, track chainrings? All of the NJS brands (SG75, Dura Ace) only go up 54, as that's the biggest NJS allowed chainrings. Sugino makes the Zen line, but they're expensive. Gebhardt make them and they're not too pricey. Gr8 Designs does those custom orders from Oz. Dixie flyer makes some, also I believe on a custom order basis. I think Bespoke Chainrings makes some big ones, but they're also very pricey. I've seen some international rides on Kronos and Ridea chainrings, but I can't figure out how one actually orders them. Perhaps they're largely a euro-only thing. Team GB also rides often on these all-black, mildly patterned/milled chainrings that have no identifying logos. I run GR8 rings. They cost about $65 USD each and then shipping is another $30 from Australia to the US. It's best to order more than one ring to minimize shipping. Most of the rings I have are fine, though some are a bit tight around the SRM spider. I believe Rotor NoQ rings come large, but I had issues with those not fitting the SRM. And if you want Kronos, PM me. I believe they cost about $100 each. Dixie Flyer offers up to 64t. They get ordered in batches, may take a few weeks to get them. I have a few and they seem very well made. sorry to dig up an old post, but what are your thoughts on the Gebhardt chain rings? I am looking to get a 56 & a 60t chain ring from them but can’t find many reports on their quality. I am guessing that no news is good news, as their aren’t any complaint threads either, but would be good to hear from someone who uses them! Gebhardt are great for the price. I don’t have any myself but the strongest rider I know has a 60t and has been using it for years and rode it to a national record. 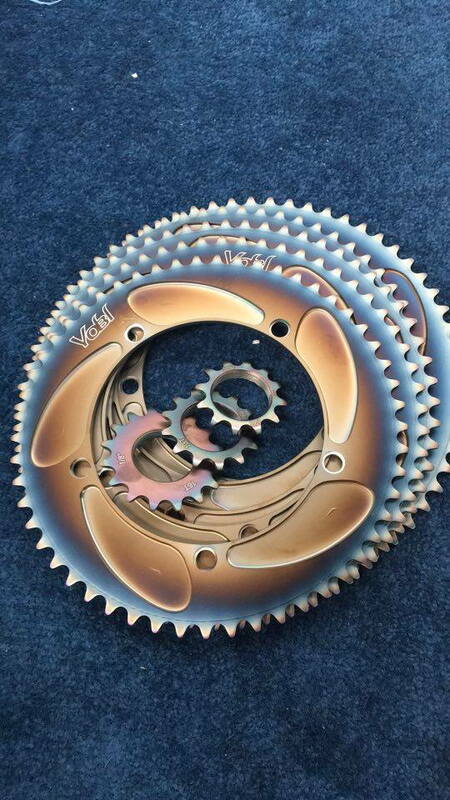 On another note and adding to the discussion, one of the Dutch riders, I think Harrie, had a pic of a new chainring from an Oz company on his IG stories. They seem to be pretty keenly priced (£150 in the UK as opposed to double that for the equivalent Sugino Big Zen, for example). Might be worth a look - AeroCoach have a good reputation for their aero testing and their Aeox disc wheels. they certainly look cool and I’m sure the performance is great but I can get three gebhart rings for the same price! On a different note, its strange that they are using a half link chain in the product images - I thought they were shown to have a lot more drivetrain friction than a standard style chain? The GR8 Rings are GREAT... unfortunately my legs are not.. I have my 55 hanging on the wall at home. His chain whip that he makes is worth a look too. I just got a brand new FSA 54 on EBay for $40.00. No one else bid on it. I purchased a 58 Gebhardt from Sonic Cycles in the UK, for £55 inc delivery which was a bargain. Quality seems decent enough - not as nice as my DA rings for sure, but they seem stiff enough. Most importantly they are straight and seem decently round! Would buy again. Miche also does big chainrings for a very good price. On the other hand, in my experience Gebhardt’s rings don’t last long. Anybody with experience with Kappstein Elite chainrings? Big (49-63t) and expensive (200 euros). Was hoping to live vicariously through other fancy members here. Isn't that what the internet is all about? Some of the guys at my local track league have some of these rings and they are bloody lovely to look at. Last edited by Kaben; 02-25-19 at 02:06 AM.